This contemporary design is printed on a textured board with silver foiling on all three trees. 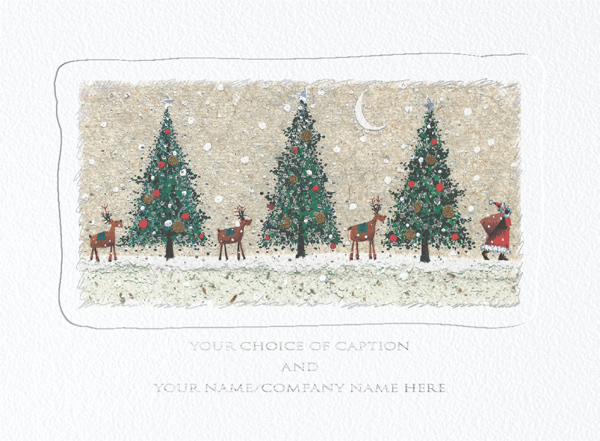 With this personalised Christmas card you can have your choice of caption and your family name / company name printed in silver foil, beneath the design. The foiling is hard to see on this web image, so please do request a free sample if you would like to see this design, prior to ordering. By purchasing the Journey's End - Front Personalised Christmas card 10p for each card you purchase will be Donated to the Charity of your choice from the Charities listed below.